Chelsea: Hey guys, just to circle back to the conversation we had around the campfire this summer at Grandma’s – are we all in for a family ski trip this winter? Chelsea: Hi cousins and siblings! What are we all thinking in terms of booking a ski trip this winter? It was great seeing you all for Thanksgiving – would be great to think about planning this trip… what does everyone think? I’m not going to say outright my family is dysfunctional. However when it comes to planning a big ski trip with cousins, aunts, uncles, nieces and nephews, we are anything but functional. It’s a friendly, happy group but trying to coax it in a specific direction is like herding kittens. Feral kittens. 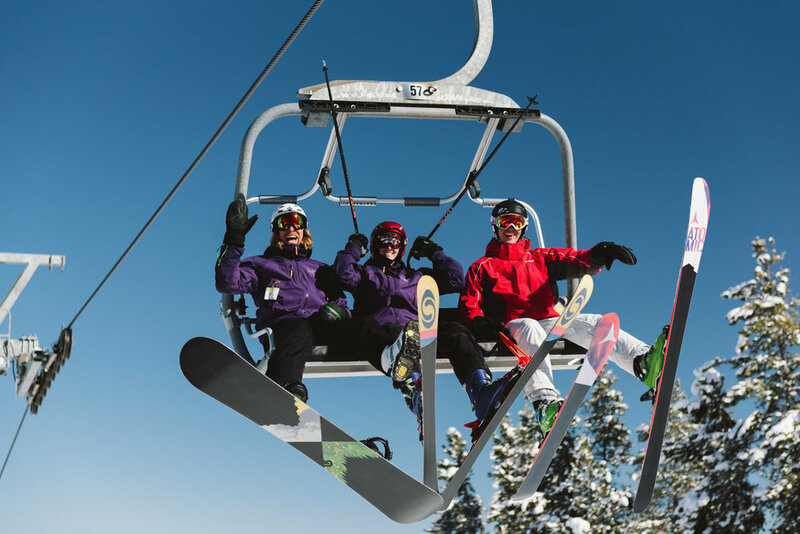 After chatting excitedly about how fun it would be to all stay close together on a mountain where those skiing could catch great laps, new skiers could snag a lesson, and those watching the littlest ones could hangout together and feel apart of things we hit a lull. It seemed too good to be true. Juggling schedules of ten adults and another ten children is daunting at best, and finding one place that would meet so many unique needs was a tall order indeed. Upon a little research though, we quickly learned Kimberley Alpine Resort makes planning a trip like this, dare I say, easy. 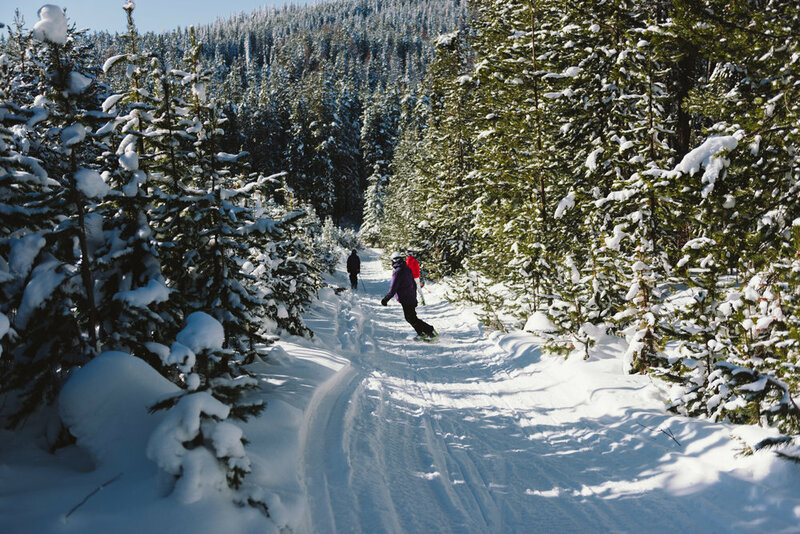 With it’s beautiful, reasonably priced ski-in – ski out lodging including fully equipped kitchens, heated outdoor pool and hot tubs, on-mountain restaurants, and North America’s longest night skiing run Kimberley Alpine Resort was the perfect destination, and heck of a good time. Nestled in the Purcell mountain range in the East Kootenies, the city of Kimberely is equal parts charming and laid-back. With just over 7000 residents the city has a small-town feel, yet with it’s dedicated Bavarian style Platzl, it also has entertainment that rivals a much bigger centre. It’s a place where festivals, live-music, street dancing, and parades all meet, where one can walk from shop to shop, and hop from one restaurant to the next each specializing in some wonderful delicacy. We definitely ate our weight at both the Stonefire pizzeria where the kids sat entranced in their, “front row seats,” watching pizza dough skillfully tossed in the air, and also at the Kimberley City Bakery. If you are wondering if it is worth the trip just for the baked goods – yes, yes it is. 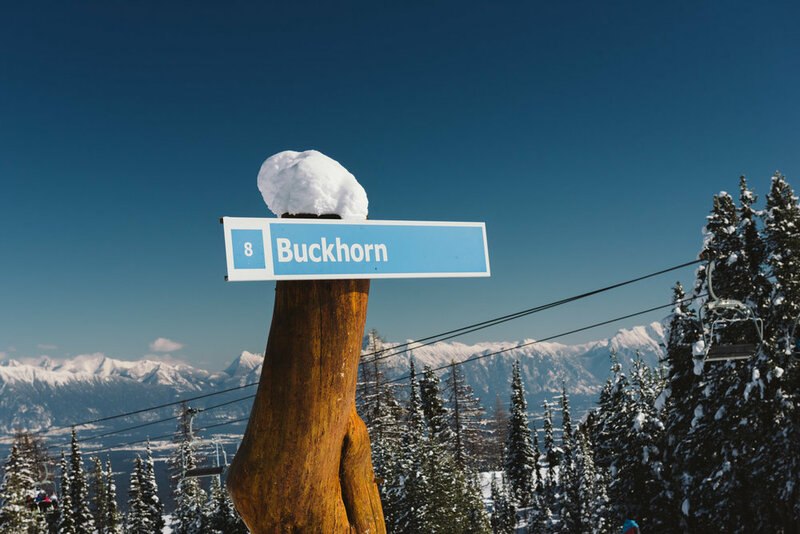 The ski hill reflects a natural extension of the city – amazing snow, laid-back feel, and an odd sensation that you’ve been there before with its homey and inviting vibe. Our group of twenty got to know the friendly staff that truly made the experience. No one was ever in too much of a hurry to lend a hand, and staff were always looking for ways to help out. The kids each received little tutorials on how to ride the T-bar more effectively by the lift operators, (unfortunately eradicating some hilarious crashes), and the experts in the rental shop willingly shared their expansive knowledge on ski-set-up. They ensured our children’s skis would indeed pop off upon wipeout instead of breaking their legs - which may have been the way we had been setting them for the last five years. MAY is the operative word in this sentence. After taking an easy driving day out on Saturday, it was really fun to be able to get some skiing in that evening. The lights of the city below were breathtaking, and it was a perfect end to the day and start of the trip. After excitedly jumping on the lift for night skiing Saturday evening, a few in our group decided lessons for the kids would be a great idea, which proved their weight in gold. The instructors embodied all the excellent attributes we found to be standard at the resort thus far - kind, knowledgeable, patient and confidence-inspiring. The proof was really in the pudding as we watched the kids rip down the very run that had given them trouble the night before laughing and whooping the whole way. Beyond the resort providing a great destination for a big group to enjoy each other and the beautiful British Columbian Mountains the skiing was nothing short of epic. We found fresh turns, some beautiful glades, and lovely rolling runs that the kids (or the inner-kid within the adults) found little jumps to pop off along the way. With an average snowfall of 13 feet and the resort sprawling over 1800+ acres, it wasn’t surprising that there was great skiing for everyone. Those taking turns with the smallest kids spent time splashing and playing in the pool, and soaking in the hot tub watching and cheering on those getting their ski legs under them on the green chair while they waited to get tagged out and take a turn on the mountain. 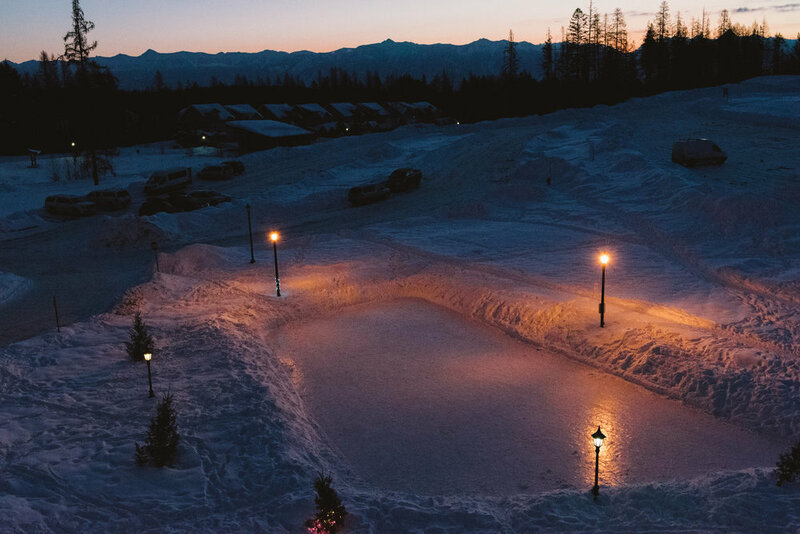 If that weren’t enough already, opposite the ski mountain sat a beautiful skating pond surrounded by the breathtaking mountains, and warmly lit by lampposts to provide skating time well after dark. It was a very iconic Canadian scene. There was one problem with our get-away to Kimberley. We had too much fun on the hill, we didn’t check out the cool little climbing gym in town, or the Lussier Hot Springs out of town. I guess I better start texting now, so our clan can get a jump on planning for next year.